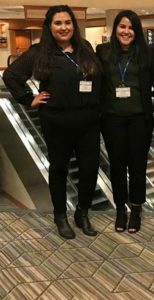 DC3 Bridges Program students Vanessa Hernandez and Carmen Del Real, accompanied by Program Sponsor Elizabeth Wallace, traveled to Washington DC, February 22nd-24th, to present their LSAMP research that they completed last summer to the Emerging Researcher’s Conference. “We are all so extremely proud of these young women,” Wallace said. The Bridges sophomores who have been admitted to the Developing Scholars Program are: Bryant Avila; Carmen Del Real; Vanessa Hernandez; Elena Carlos; Laura Soto; Yesenia Herrera; and Leonardo Garrido Alvarez. This group will also be attending the New England Science Symposium on April 8th at Harvard Medical School in Boston, MA.